Bishopstown Chiropractic Clinic offers a wide variety of services to fit the needs of the entire family. 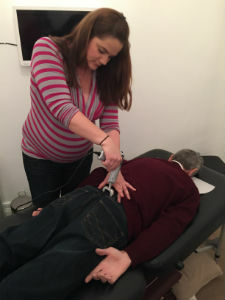 Dr Celine specialises in low-force techniques to ensure effective chiropractic care in the gentlest way possible. Traditional manual adjustments can also be done based on your specific needs. Dr Celine is also certified in the Webster Technique to help pregnant patients with sacral subluxation. Chiropractic care can benefit your entire body and help your body heal itself. Your chiropractic care plan is customised to meet your individual needs. During your comprehensive examination Dr Celine will take a photo of you and scan the image into the specialised computer system Posture Pro®. You will be able to see your exact posture and the computer analysis will show you what your posture should be. Dr Celine will then be able to customise your care plan to meet your needs. Let Dr Celine find the technique that is just right for you. Managing pain is not a quick fix. We incorporate education into each visit to keep you informed about your condition and treatment options. The Impulse iQ® instrument is gently applied to the dysfunctional area we are treating. The instrument will read signals from joints under the surface. With localized controlled force it uses the exact amount of pressure necessary to create movement in the joint. When the joint releases it shuts itself off. Patients love this new technique because it is much gentler than traditional techniques. This can be used for muscles as well. The results have been phenomenal. Stop letting pain control your life. Contact us today and we’ll help you find the technique that is right for you.